Is there a future in electric aircraft? Tell us what you think. What do you think is the future of electric power in light GA? It’s our future. Within the next decade or so, most new light planes will be electrically powered. Electric power will play a role in light GA, but not to as big an extent as some might think. Planes with electric power will be a small but present part of the fleet before too long. Electric planes will remain a curiosity. Want to learn more about electric aircraft? Read our article about the Hamilton aEro. For all those folks who just like to make laps around the pattern or fly to the next airport for breakfast, an electric airplane will be ideal. It will eliminate much of the maintenance and waste associated with a piston engine — oil changes, spark plugs, air cleaners, etc. — and almost banish the vibration-caused problems that crack components. Propellers can be lighter because they will be driven smoothly, not with a series of pulses. Electric airplanes will be quieter, reducing the need for noise-cancelling materials and devices, and curtailing hearing damage. Less noise and fewer emissions should reduce the ire of airport neighbors. Their pilots won’t have to worry about succumbing to carbon monoxide fumes either. There will be no loss of power with altitude or high temperature. While long-range electric airplanes still seem to be in the future, I think an electric light sport would be superior to a piston-powered one in almost every way, with battery weight and duration setting their limits. I’m a big proponent of electric aircraft. Unfortunately, GA is stuck with an ossified industry, backward-looking market, and government regulatory apparatus that is only starting to become pro-active. I doubt that we’ll see as many electric airplanes flying as I’d like to see. I can see the value in electric aircraft in training where circuits and the local training area are used. It would be wise to remain relatively close to home base or other regional air ports for the necessary top ups. Perhaps a Hybrid version similar to motor vehicles may give GA aircraft a longer range. I am all for change, innovation, longevity, quiet operation etc, etc, but until an electric driven airplane, seating four PAX, can fly me safely 500 to 600 miles, I have no need for one. Elon Musk may change my mind someday. I think electric airplanes will have a future as training aircraft but I don’t see much demand for FBO’s to put in quick charge stations. Its gonna happen sooner rather than later for all the reasons cited by Art Friedman. In 10 years I think electric trainers will dominate , limited only by acquisition costs for the flight schools. And expect a significant rating difference between electric and petrol powered airplanes. In 50 years, electrics will dominate light aircraft (2-6 place) segment. We’re basically flying the same engines that we were in the 1950’s. The biggest change has been in avionics and airframe materials. 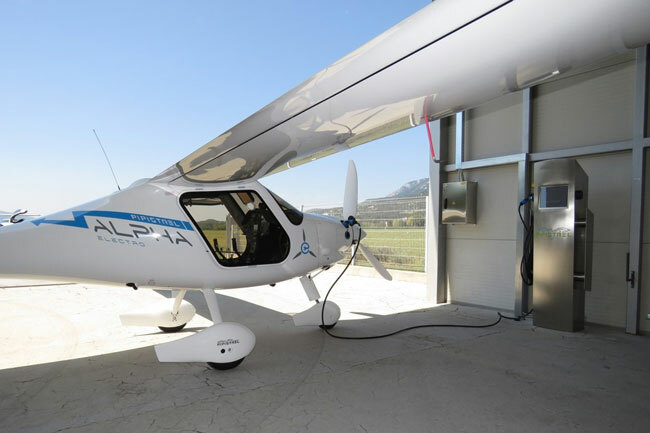 With weight being much more critical in aircraft than in cars, it will take a MAJOR breakthrough to make electric flight as common as piston engine aircraft. Too much weight means longer takeoffs, higher landing speeds, less useful load, higher stall speed and shorter range. I’m sure there’s even more points as that’s just a quick observation. Expect the price of entry to be just as high as IC engines as technology ain’t cheap ! (I fly RC airplanes as a hobby and electrics have all but taken over the sport. I can buy a quality nitro engine for $150, but the same quality motor, speed controller and lithium-poly batteries will set me back $300. Remember, I said QUALITY.) I don’t expect to see general aviation flourishing because of electric flight any time in the near future, but the hope is that general aviation in the USA survives our economic future. Hybrid aircraft will solve the range issue.